Buy 12-14 cookies for pick up at our Milford Location Monday - Wednesday, Thursday and Friday when we are open. Flavors Available Now for Your "My Way Assortments." Almond Toffee Chip: A savory blend of almonds, mixed with toffee brickle, and semi-sweet chocolate chips. Blue Chip Joy: A marriage of almonds, coconut, and semi-sweet chocolate chips comes together for a whimsical delight. Black & White: White chocolate chips mixed with our signature oban-infused dough that offers a sweet and delightful profile. Blue Chip Royale: Slivered almonds meet with white chocolate, and toffee bits that offer a tasty treat fit for a king (or queen). Cinnamon Delight (Snickerdoodle): Our sugar cookie is infused with cinnamon and spice that has a profile that’s light and airy with great flavor. A favorite for many! Snicker-snap-snickery-doodle. Double Chocolate Chip: Milk chocolate and semi-sweet chocolate chips mixed to perfection for a fresh, sweet take on a classic. Lemon Delight: Our sugar cookie dough infused with lemon extract, light and airy! Triple Chocolate: Three of your favorites chocolates in one cookie! Semi-sweet, milk chocolate and the earthy oban chocolate come together for a delicious savory, chocolatey treat that has a flavor profile out of this world. White & Black (Double Delight): We take our classic chocolate chip and add to it Guittard white chocolate. Pretty cookie that appeals to the dual nature of chocolate lovers. White Chocolate Chip: White chocolate is substituted with our classic chocolate chip cookie for a lighter, creamier, scrumptious cookie! 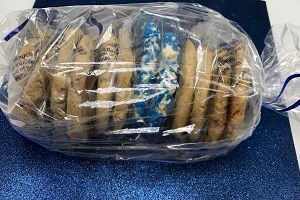 White Chocolate Chip Macadamia Nut: What Blue Chip Cookies is known for across the country. "The first bakery to introduce the White Chocolate Chip Macadamia to the public." Flavors available under the "Buy Single Flavor" or will be featured in the MyWay one month during the year. Chip, Chip Hurray: Cookie creation in 2017, Peanut butter chips and semi-sweet chips rolled together. Lemon Meringue: Our lemon cookie with white guittard chips! Taste like a mini meringue pie, oooh la la. Red Velvet: Our regular dough with cocoa and red velvet mix, white chips. Triple Treat: A triple chocolate threat with white chocolate, milk chocolate and semi-sweet chocolate. This is a very sweet cookie. White and Black (Also known as Double Delight): Half chocolate chip semi-sweet and half white chocolate. We add a free single cookie!